want to learn more about alprolix? We'd like to send you helpful information on hemophilia B and ALPROLIX from time to time. If you're still considering ALPROLIX we'll send you a Bluetooth®speaker to listen to patient stories or if you're already on ALPROLIX, a cooler bag for factor. Bluetooth is a registered trademark of Bluetooth SIG, Inc. All rights reserved. ALPROLIX uses a natural pathway to extend factor in your bloodstream. See the details and design of our study that involved 153 patients. Find additional ALPROLIX safety info here. We adhere to strict standards throughout the ALPROLIX manufacturing process. ALPROLIX offers the most vial sizes of any hemophilia B factor. *The recommended starting prophylaxis regimens are either 50 IU/kg once weekly, or 100 IU/kg once every 10 days. Dosing regimen can be adjusted based on individual response. "I feel fortunate to be in a position where I can tell people about the positive changes prophy made in my life." This is a personal account of an ALPROLIX Peer. Please talk to your healthcare provider about whether ALPROLIX may be right for you. Individual results may vary. Whether you're looking to make the switch to ALPROLIX or already on it, it's important to talk to your doctor about your treatment and bring up any questions or concerns you might have. Naturally produced Factor IX flows through the bloodstream and enters cells within your body; eventually breaking it down. The Fc portion of ALPROLIX allows it to bind with an Fc receptor already in your body. The binding with Fc receptor redirects ALPROLIX back towards the bloodstream to protect ALPROLIX from being broken down inside the cell. By using the natural Fc process, ALPROLIX is able to recirculate in the body longer. Eventually ALPROLIX is broken down, but without Fc Fusion, it wouldn't be able to recirculate in the bloodstream to extend the time you are protected* from bleeds. *ALPROLIX has been proven to help patients prevent bleeding episodes using a prophylaxis regimen. We'd like to send you helpful information on hemophilia B and ALPROLIX from time to time. If you're still considering ALPROLIX we'll send you a Bluetooth® speaker to listen to patient stories or if you're already on ALPROLIX, a cooler bag for factor. If your healthcare team is pleased with the progress of your treatment, you can ask them if you might be able to extend your dosing schedule. Your doctor may have to adjust your dosing to 100 IU/kg. *54% of people in the individualized prophy arm extended to ≥14-day dosing. The overall median dosing interval on study was 12.5 days. The median interval during the last six months in 26 subjects who were on study for at least nine months was 13.8 days. Worked with his doctor to extend his dosing schedule. Switched from on-demand to prophy. 2 sons with severe hemophilia B are on ALPROLIX and took part in the clinical trial. The safety and efficacy of ALPROLIX has been studied in two completed and one ongoing extension study of 153 patients ages 1 – 71. Patients were previously treated males with severe to moderately severe hemophilia B. There were 123 patients treated for at least 52 weeks and 93 patients for at least 104 weeks, with multiple characteristics of ALPROLIX assessed, including safety, efficacy, and pharmacokinetics. In the clinical studies of 153 previously treated people, adverse reactions occurred in 14 participants (9.2%). Headache, abnormal sensation in the mouth, and pain in your side with blood in your urine, which may be a sign of a clot formation in the urinary collecting system occured in two people† (1.3%). Dizziness, bad taste in the mouth, breath odor, fatigue, infusion site pain, palpitations, low blood pressure, and/or decreased appetite occurred in one person (0.7%). †The obstructive clot in the urinary collecting system of the 2 subjects was resolved with hydration and they remained on the study. Zero inhibitors were detected in the clinical study of 153 previously treated people. Formation of neutralizing antibodies (inhibitors) to Factor IX has been reported following administration of ALPROLIX, including in previously untreated patients. Following administration of ALPROLIX, your body could make antibodies against your Factor IX called "inhibitors," which may stop ALPROLIX from working properly. Your healthcare provider should continue to monitor you with blood tests to check for inhibitors. If you have developed an inhibitor with use of another Factor IX therapy, you may be at an increased risk of anaphylaxis with use of ALPROLIX. 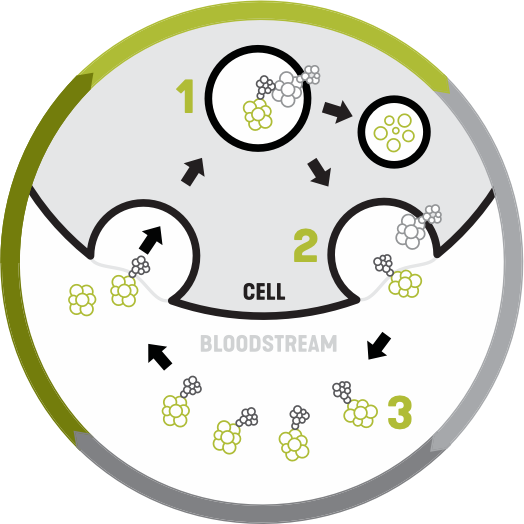 Protein-producing host cells are grown in high-tech containers called bioreactors. These host cells produce protein into the cell media. That protein is then purified. To enhance viral safety, the process uses nanofiltration and purification steps that have been validated for viral clearance. Finally, ALPROLIX in single-use vials labeled 250, 500, 1000, 2000, 3000, or 4000 International Units (IU) per vial of ALPROLIX as lyophilized powder. Liquid diluent comes in a prefilled syringe. 1. IDELVION® [package insert]. Marburg, Germany: CSL Behring GmbH; 2017. 2. AlphaNine® SD [package insert]. Los Angeles, CA: Grifols Biologicals Inc; 2013. 3. BeneFIX® [package insert]. Philadelphia, PA: Wyeth Pharmaceuticals Inc, a subsidiary of Pfizer Inc; 2015. 4. Ixinity® [package insert]. Berwyn, PA: Aptevo BioTherapeutics LLC; 2016. 5. Mononine® [package insert]. Kankakee, IL: CSL Behring LLC; 2016. 6. Profilnine® SD [package insert]. Los Angeles, CA: Grifols Biologicals Inc; 2010. 7. Rixubis® [package insert]. Westlake Village, CA: Baxalta US Inc; 2016. Graphic not representative of actual drug product vial. What is the most important information i should know about ALPROLIX® [Coagulation Factor IX (Recombinant), Fc Fusion Protein]? You should not use ALPROLIX if you are allergic to ALPROLIX or any of the other ingredients in ALPROLIX. Tell your healthcare provider if you have had an allergic reaction to any Factor IX product prior to using ALPROLIX. Allergic reactions may occur. Call your healthcare provider or get emergency treatment right away if you have any of the following symptoms: hives, chest tightness, wheezing, difficulty breathing, or swelling of the face. ALPROLIX may increase the risk of forming abnormal blood clots in your body, especially if you have risk factors for developing blood clots. Call your healthcare provider or seek emergency care if you have symptoms of a possible abnormal blood clot, which may include: chest pain, difficulty breathing, unexpected swelling of an arm or leg with or without pain or tenderness. Your body can also make antibodies called "inhibitors" against ALPROLIX, which may stop ALPROLIX from working properly. Your healthcare provider may need to test your blood for inhibitors from time to time. THE MOST COMMON SIDE EFFECTS OF ALPROLIX INCLUDE: headache, abnormal sensation in the mouth, and pain in your side with blood in your urine, which may be a sign of clot formation in the urinary collecting system. These are not all the possible side effects of ALPROLIX. Talk to your healthcare provider for more information and about any side effect that bothers you or does not go away. WHAT SHOULD I TELL MY HEALTHCARE PROVIDER BEFORE STARTING ALPROLIX? Have or have had any medical problems. Are taking any prescription and non-prescription medicines, such as over-the-counter medicines, supplements, or herbal medicines. Are pregnant or planning to become pregnant. It is not known if ALPROLIX may harm your unborn baby. Are breastfeeding. It is not known if ALPROLIX passes into breast milk or if it can harm your baby. Have been told that you have inhibitors to Factor IX (because ALPROLIX may not work for you). If your bleeding is not controlled and you experience a lack of clinical response to Factor IX therapy, call your healthcare provider right away. Medicines are sometimes prescribed for purposes other than those listed here. Do not use ALPROLIX for a condition for which it was not prescribed. Do not share ALPROLIX with other people, even if they have the same symptoms that you have. ALPROLIX is an injectable medicine that is used to help control and prevent bleeding in people with hemophilia B. Hemophilia B is also called congenital Factor IX deficiency. Your healthcare provider may give you ALPROLIX when you have surgery. HOW SHOULD I RECEIVE ALPROLIX? ALPROLIX should be administered as ordered by your healthcare provider. You should be trained on how to do infusions by your healthcare provider. Many people with hemophilia B learn to infuse ALPROLIX by themselves or with the help of a family member. See the booklet called "Instructions for Use" packaged in your ALPROLIX for directions on infusing ALPROLIX. If you are unsure of the procedure, please ask your healthcare provider. Please read this information carefully before using ALPROLIX and each time you get a refill, as there may be new information. This information does not take the place of talking with your healthcare provider about your medical condition or your treatment. The risk information provided here is not comprehensive. To learn more, talk about ALPROLIX with your healthcare provider or pharmacist. The FDA-approved product labeling can be found at www.alprolix.com or 1-855-MyALPROLIX (692-5776). © 2019 Bioverativ Therapeutics, Inc., an affiliate of Sanofi. All rights reserved. That's okay. We just had to let you know you're about to leave ALPROLIX.com. Thanks for stopping by.